Get inspired by these affordable backyards. Backyard Landscape Ideas with pictures. Designing your landscape is just as important as designing any part of your house. Landscaping ideas that are skilfully carried out can complement your home’s aesthetic. You can enhance the whole appeal of your backyard by choosing the suitable shrubs, garden edges, plants, and flowers. Before you start designing your backyard where space is limited, you must create an inventory of your backyard space. As there are many landscaping ideas to choose from, try to figure out which one would fit best for your space and then make adjustments to create your perfect garden. Consider the fact that you may want to have a pool or a playground for the kids, or if you want to work outdoors then you make space for a flower garden. For some people, it is their lifelong dream to grow their own vegetables, fruit and herbs. Try to consider what your family really wants. The backyard is a unique entity, so design your garden with that in mind while keeping an overall theme. Landscaping on a tiny budget can be difficult, but not impossible. Are you improving an existing landscape design or starting from scratch with a complete new look? What maintenance will be required once you install your landscaping? Are you choosing one small area or project such as installing a few beds with edging or building a vegetable garden in a raised bed? Which part of the yard looks the best – and why? Which part looks the worst? Examine the worst parts and make a list of priorities. Is the grass dead or full of weeds? Are the flowerbeds neatly edged or messy? Are trees and shrubs trimmed appropriately? Answering these questions will help you determine which materials and plants you’ll need and should also help you prioritise you’re spending. 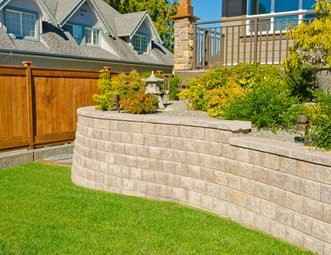 Make simple improvements to your existing landscaping. This is probably the most effective way to get a new look without overspending. Take a photo of your backyard, and consult a professional for an estimate to determine just how far your budget will stretch. Perhaps your money would be better spent making small adjustments to your landscaping rather than installing additional plants. Choose plants that give you more value for your money. A boxwood hedge may seem boring, but this evergreen could provide the clean lines your yard needs. Stunning roses brim with brightly coloured blooms but are virtually maintenance free and work almost anywhere in a yard. Annuals can be costly and require replacement seasonally, whereas many beautiful perennials can be planted or started from bulbs or clippings. Ask friends to give you pieces of their plants to get your flower garden started for free. For a cleared steep incline behind a retaining wall, consider ground cover plants. There are many varieties of flowers and shrubs that thrive on slopes. If your steep hill gets full sun and doesn’t encounter an overwhelming amount of rain or water runoff, consider dotting it with thyme, the fragrant, delicate herb is easy to grow and blooms pink in the spring. If your hillside or gentle slope is wooded but gets sunlight, add a touch of flavour with azaleas or rhododendrons, both of which can grow on inclines and can handle shade and sun.